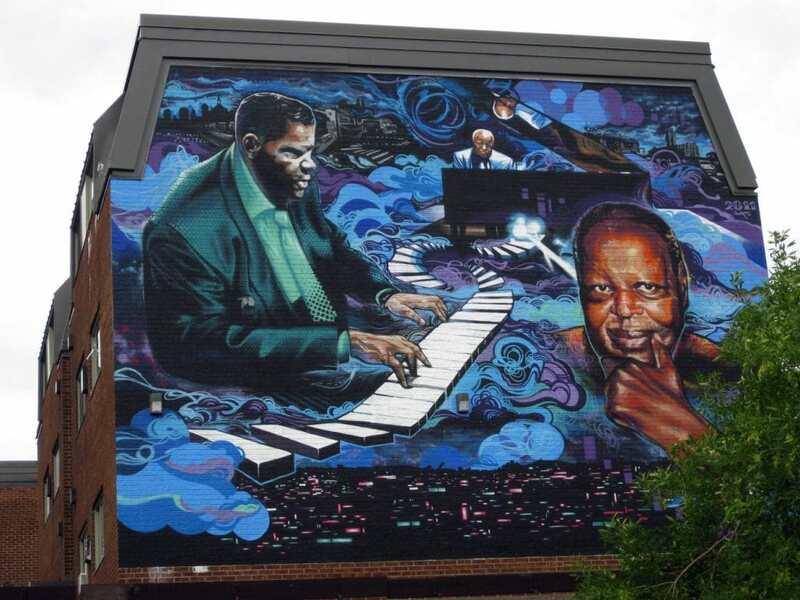 This 950 square feet mural by Gene Pendon pays tribute to the great genius internationally renowned Montrealer pianist Oscar Peterson, in honor of the 5th anniversary of his passing. It was the opportunity to embellish the neighborhood where he was born but also give pride to its community by celebrating its musical heritage. The imagery was taken directly from the Peterson’s family personal archives. The piano notes channel the famous pianist international career path, depicted at different periods of his life. The use of the blues, the purples, the black in the colors and the motifs is a reference to Jazz’s nightlife. The cityscape at the top of the mural represents Little Burgundy, as admired daily by the muralist from up his scaffolding while creating his piece. This project was developed in partnership with the community of Little Burgundy, known for the vitality and dynamism of its residents. Mural art workshops were given to neighborhood youth (13-17 years old) in collaboration with Local 850.